This post replaces my first ever blog post, made for Easter 7A 2008! So, it's a 9 (liturgical) year anniversary party over here at Singing From the Lectionary Central! The Ascension: the promise of Christ’s return. The promise of the Spirit. The disciples get together to pray (constantly) before they commence their mission without Christ incarnate. See here for Ascension songs. *Taizé / MV075 / StS079 / SFFS 2118 / GtG284 / GC(II)479 / G(3)547 / SP99 / URW395 Holy Spirit Come to Us / Veni sancte spiritus / Tui amoris (Berthier) Best if you have a cantor, but works well if you don't, too. Sheet music, translations, sound samples. Taizé / TiS 730 / AoV1-152 / ATOK 387 / CH775 / UMH488 / WoV740 / ELW616 / GA308 / A&M838 / HPP214 / GtG227 / PH599 / G(II)293 / GC404 / GC(II)422 / G(3)510 / W&R285 / Cha569 / Srce387 / URW382 / Lau253 / StF777 Jesus remember me (Berthier) A beautiful chant, but we have not sung it often. Sheet music and sound samples. *Traditional / StJ / GC(II)567 As I went down to the river to pray (Folk song) Dunno about the "Good old way" bit, but the encouragement to pray together with each other is a good theme, and the song is a favourite among our congregation. I'm not sure if we've ever sung it as a congregation, but it would be good to do so. Here's the clip from O Brother Where Art Thou, which made it so popular. Oldy-but-a-goody. Let God arise and God's enemies be scattered. God cares for the poor. *TiS 38 / VU787 / GA046 / G(II)63 / GC67 God In Your Goodness / You Have Made a Home for the Poor (Bonighton or Cooney) Each hymnal has a different way of writing the verses, some need a cantor, but all could work well with someone reading the verses. Both versions of the refrain are very straightforward. MV142 / SP&P209 Oh a Song must rise (Svenson) A song that speakes of voices being raised from around the earth, from all people. A good song of unity. Quite straightforward to sing. NCH039 / CH176 / UMH149 / WoV726 / GtG669 / G(II)375 / GC553 / W&R33 / Cha060 Creator God we sing / Cantemos al Creador / Cantemos al Senor / Let's sing unto the Lord (Rosas) Joyful song of praise with lots of Alleluias. NCH more inclusive language is better; some translations are very simplistic. 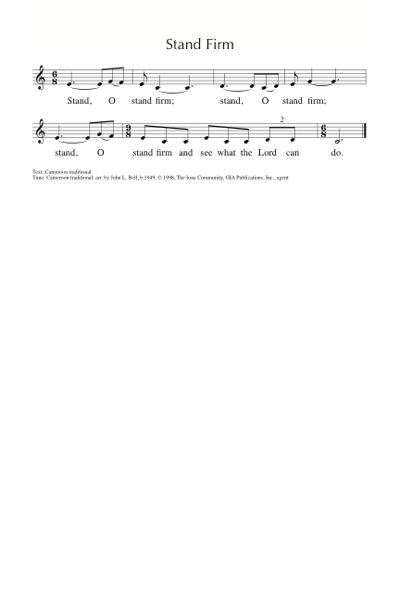 Emergent Psalter / PfAS068B Sing to God O kingdoms of the earth (Everett) A good Psalm refrain, simple to sing, with nice chords. The Psalm can be read or chanted over an improvised vamp. Sheet music (click on the Downloads tab). *MV221 I am walking a path of peace (Tissandier) A simple song for the end of the service; words can be altered to paths of love, grace, hope, joy etc. Good for kids. *NCH005 / VU243 Praise to God praise to God for the greenness (Hanaoka) Earth's beauty; sung to a simple and quite familiar Japanese tune (SAKURA). A good hymn for kids who can read. Good for kids. Rejoice in suffering. Be disciplined. Be humble because God cares for you. Jesus’ parting prayer on our behalf. God’s care for us. Prayer for unity. Tune In: Father of Earth, Mother of Sea (Brown) A latinesque song about the Spirit being with those who are victims, prisoners and the sick, as well as present in our prayers. Lyrics, sound sample and songbook. *Tune In / ATAR596 He comes with his arms open wide / The God that I know (Anderson) A ballad drawing on God’s strength and comfort; not easy if unfamiliar. Lyrics and sample and songbook here. Tune In: Like the sun upon my skin / God’s Mercy A beautiful ballad about identifying God's mercy in the beauty of creation. Lyrics, sound sample and songbook. MV142 / SP&P209 Oh a Song must rise (Svenson) A song that speaks of voices being raised from around the earth, from all people. A good song of unity. Quite straightforward to sing, and a good prelude to Pentecost next week. HPP498 / Cha495 / URW057 Weave weave (Crow) A simple 6/8 chorus asking God to "weave us together in unity and love". Do you have some ideas? Please share them in a comment below! Happy Anniversary! Thanks for all your good work! happy anniversary, well worth celebrating.